1. Articles, especially unsolicited submissions, should be submitted electronically to ses@uwimona.edu.jm and must contain original unpublished work, not being considered elsewhere. 2. 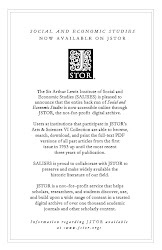 Articles not submitted in the journal’s format and style will not be considered. The Chicago Manual of Style is the reference book for SES’s house style. 3. Articles should be word-processed, flush left, unjustified, using double spacing (including notes and quotations), with generous margins on all four sides. Authors should retain a true copy. The first line of each paragraph should be indented except after titles and sub-heads. Unclear copy will not be reviewed. 4. Pages should be numbered consecutively. Length of articles should be 7,000 to 10,000 words including notes and Notes and Comments should be in the 1,500-2,000 word range or less. Book reviews should not exceed 1500 words. 5. Since manuscripts are sent out anonymously for editorial evaluation, the author’s name should appear on a separate covering page which can be readily detached. The author’s business address and a brief biographical paragraph describing author’s current affiliation should also be on this fly-sheet, together with the title of the article. The title of the article without the author’s name should be repeated on another page. 6. Acknowledgements and references to grants, etc., should appear as a footnote to the author’s name on the cover page and should not be included in the main list of notes. 7. An abstract of no more than 100 words describing the aims, methods, findings and conclusions of the study must accompany the article. Articles without abstracts will be returned. 8. Titles of articles should not be more than eight words. There are three levels of sub-heads that can be used in articles which should come at roughly 700-word intervals. The first or highest level should be typed in plain capitals. The next level is bold caps and the third plain italics. Both the latter should be typed in upper and lower case, flush with the left margin. Numbered headings are not used. 9. Notes should be used only to provide additional comments and discussion and should be numbered consecutively throughout the article. Footnotes are preferred to endnotes. 10. SES’s citation style is based on the author-date system of referencing as detailed in the Chicago Manual of Style. * Articles should have a reference list at the end containing all the works referred to, listed alphabetically by author’s surname, with the date of the article placed after the author’s name, eg. Hall, Stuart and Sarat Maharaj. 2001. Modernity and difference, Annotations 6, London: Iniva. Note that journal titles should be given in full, including volume and issue numbers, months and date, and page numbers of the article, eg. Scott, David. 1995. Revolution, theory, modernity: notes on the cognitive-political crisis of our time. Social and Economic Studies 44 (2&3):14-15. 11. References to source material in the text should take the form of surname, year and page numbers. eg. (Paul 2002: 22-26). There should be no comma between name of author and year. 12. Short quotations should be enclosed in quotation marks and incorporated in the text. Longer quotations (more than fifty words) should be indented from both margins, with no quotation marks (all double spaced). All items cited in the text, and only those items, should be included in the list of references. 13. Dates should be rendered as follows: 9 January 1980; 1970s; twentieth century; 1945-52 but 1952-4 (i.e., do not repeat decade digit if the same). Initials such as UNESCO, FAO, etc, should not have stops between letters. English spelling should be used throughout. 14. Tables and illustrative figures are not to be included in the text. They should be numbered consecutively with Arabic numbers and should have titles as well as numbers. Tables are to be doubled spaced, with each table on a separate sheet. Figures, including maps, must also be on separate sheets and must be of professional standard and in camera-ready form. Authors are reminded that tables, appendices and graphs will be reproduced in black and white and should be designed accordingly. Their position in the text should be indicated. 16. Mathematical notation is very expensive to reproduce and should be kept to a minimum. Avoid the use of unusual symbols where common ones are satisfactory. Avoid fractions in the form a over b and use a/b instead. Avoid such distinguishing marks as carets, tildes, and circumflexes above letters, as these are not readily available and require artwork. Use the acceptable alternatives (B*) where possible. Special care is required with letters and symbols that are close in appearance, such as u and v and w and with the use of 0 and 1 where these can be read as either letters or numbers. Superscripts and subscripts in mathematical terms should be accurately aligned. Where mathematical formulae are set out and numbered, these numbers should be placed against the right hand margin, as…(1). Careful checking of the layout of all mathematical formulae including alignment, centring, length of fraction lines and type, size, position and closure of brackets, etc., should be carried out before the final manuscript is submitted to avoid corrections at the proof stage. Where it would assist referees, authors should provide supplementary mathematical notes on the derivation of equations. 17. Book review headings should appear as follows: Title, author, publisher, place, date, also pagination and price, if available. 18. Contributors will be sent proofs of their articles, if time allows, but unaccepted manuscripts will not be returned. 19. The editor reserves the right to make any corrections or alterations considered necessary. Authors should use the active voice except where they have a good reason to use the passive. “We” for two or more authors, never as a substitute for “I”. 20. Authors are entitled to 10 free offprints and a copy of the issue in which their article appears. Please do not italicize et al. and ibid. please do use fullstops after each. No section numbering please, and this means that all references to Section numbers must also be removed from text. For each author-date citation in the text, there must be a corresponding entry in the reference list under the same name and date. It is the author’s responsibility to ensure such agreement as well as the accuracy of the reference (see 2.29). Do ensure that all references cited in text of article are provided in Reference list at the end, and that the years match as well as author’s names. Quite often authors neglect one or other aspect of the aforementioned. Among other things, specific page references to a journal article, when given in a text citation, must fall within the range of pages given for the article in the reference list entry. Fogel, Robert William. 2004a. The Escape from Hunger and Premature Death, 1700–2100: Europe, America, and the Third World. New York: Cambridge University Press, 2004. ———. 2004b. “Technophysio Evolution and the Measurement of Economic Growth.” Journal of Evolutionary Economics 14 (2): 217–21. doi:10.1007/s00191-004-0188-x. Please do not italicize quotes. If you’re quoting a sentence or speech please use double quote marks; for words, phrases or terms please use single quotes. Please be consistent throughout with your punctuation. Books: author’s last name, comma, first name (regular order for co-authors), followed by a period, the publication year, and a period. Insert book title in italics and sentence case, followed by a period, city of publication, a colon, name of publisher, and a period. Journal Articles: author’s last name, comma, first name (regular order for co-authors), followed by a period, the publication year, and a period. Insert article title in sentence case without quotation marks, a period, the journal title in italics and headline capitalization, followed by the volume (issue number in parentheses, if applicable), a colon, the page number(s), and a period. In parentheses, cite the author’s last name, followed directly by the publication year with no punctuation between. Where the author’s name is mentioned in the sentence, cite the publication date in parentheses after the author’s last name wherever it appears in the sentence and before a mark of punctuation. To cite a particular part of a source, include the last name and publication year, a comma, and page number(s); for journals, include the last name and publication year, a comma, the volume number, a colon, and page number(s). Arranged alphabetically by author’s last name with a hanging indent.